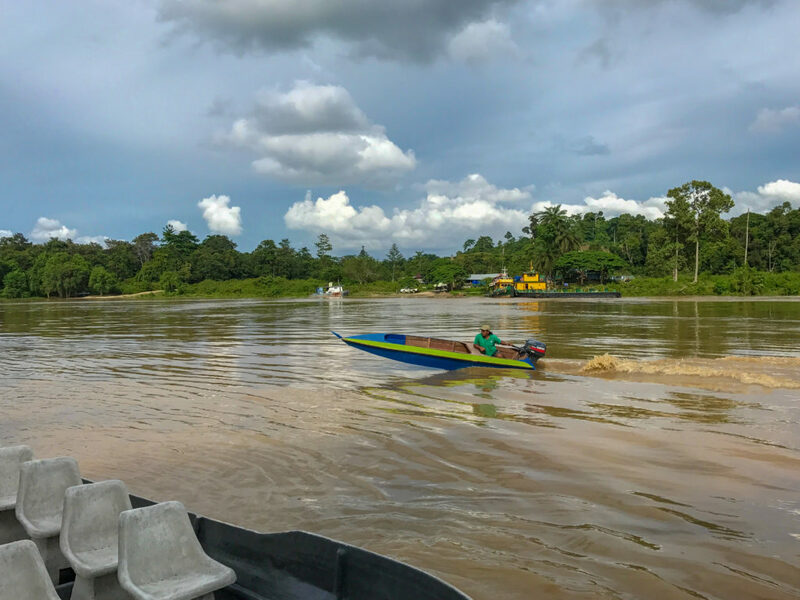 Our journey down the Kinabatangan river was definitely a highlight of our travels in Borneo – the river cruise is basically a safari but on the water! 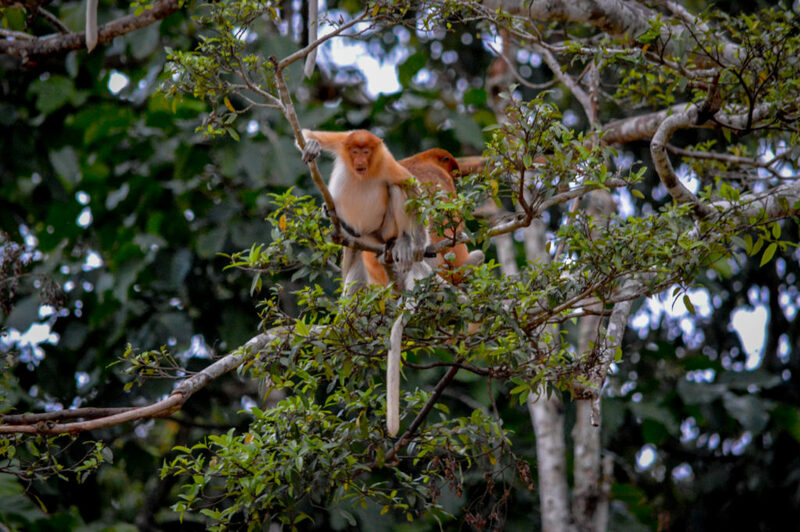 There is an abundance of incredible wildlife hanging out along the riverbanks of the Kinabatangan; from tiny humming birds to monitor lizards, snakes, orang-utans and of course the famous Bornean proboscis monkeys. 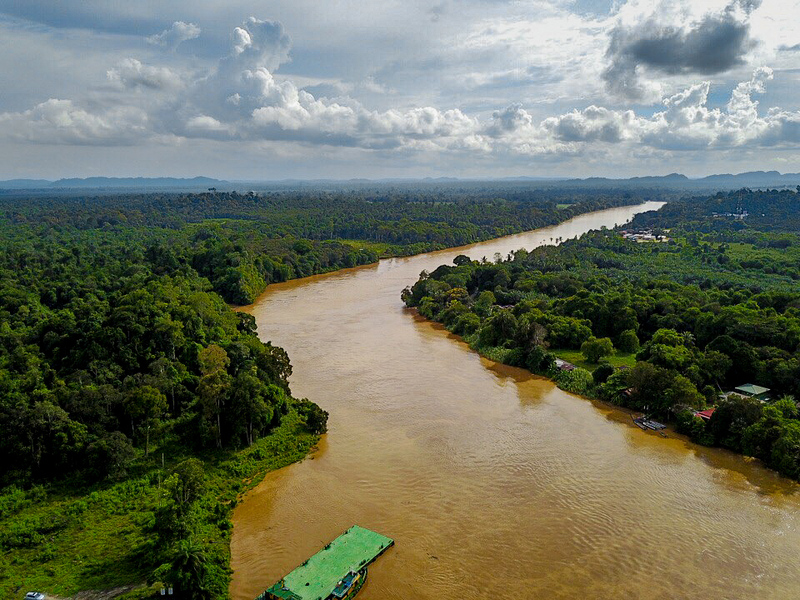 Our pick up from Sepilok went smoothly and after a very bumpy ride, it was great to arrive at the river bank. 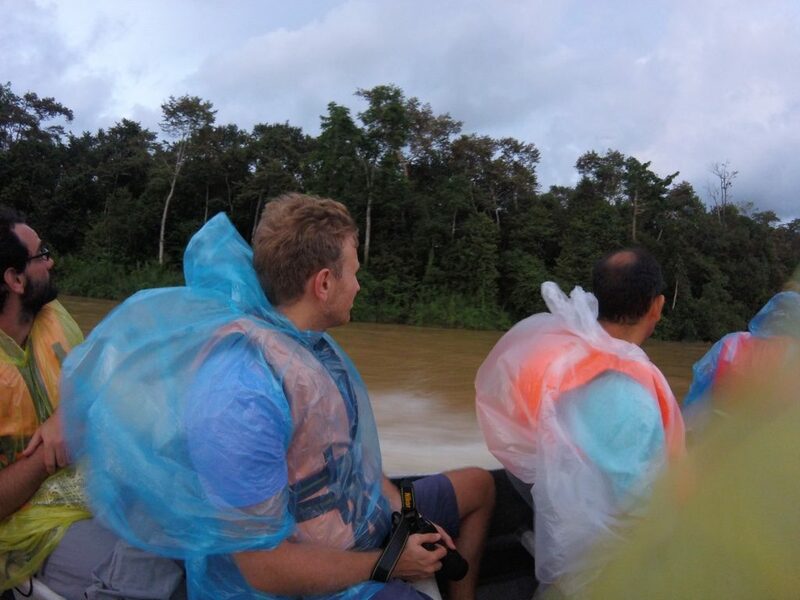 However, the journey from Sepilok to the Kinabatangan was fairly shocking. We were definitely not prepared for the drastic amounts of deforestation that we faced. 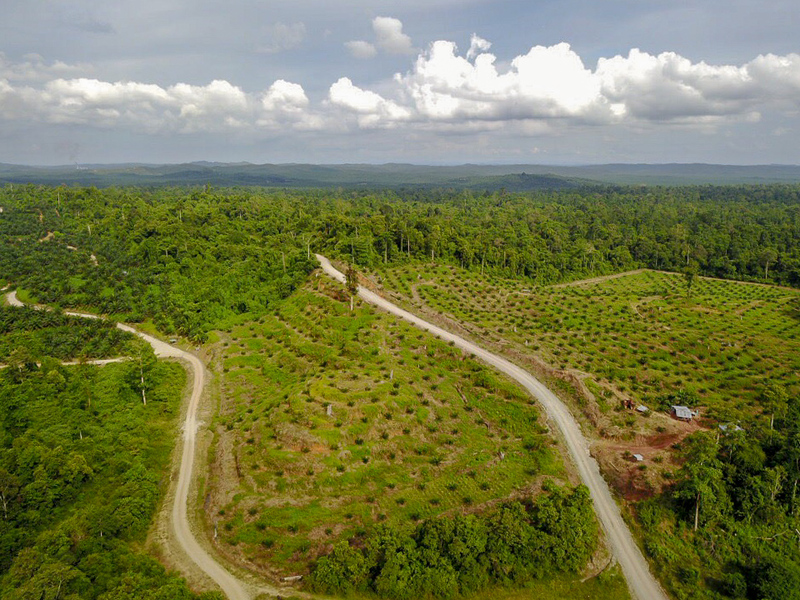 Huge parts of the rainforest are constantly being destroyed with palm oil plantations taking their place. This is definitely something that needs to be addressed before more of the wildlife is affected. 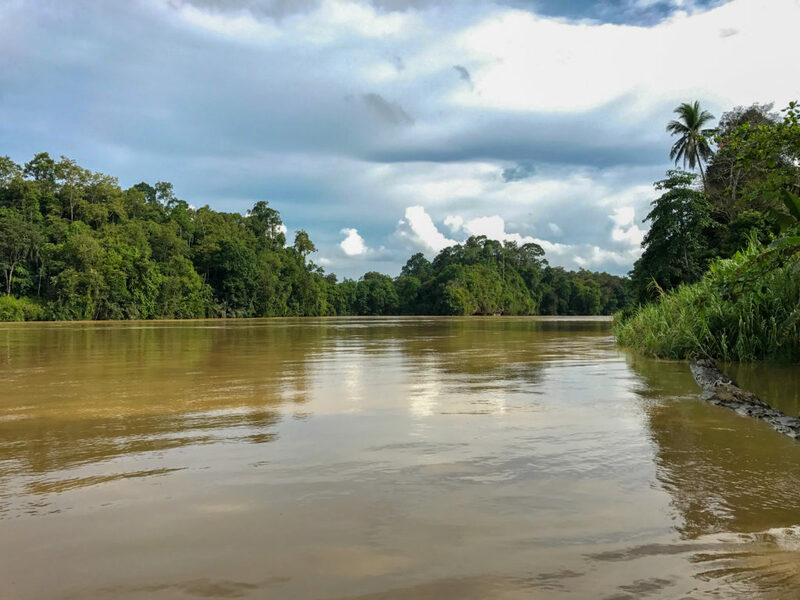 It was refreshing to head back into the Kinabatangan jungle and made us really appreciate all that we saw along the riverbanks. 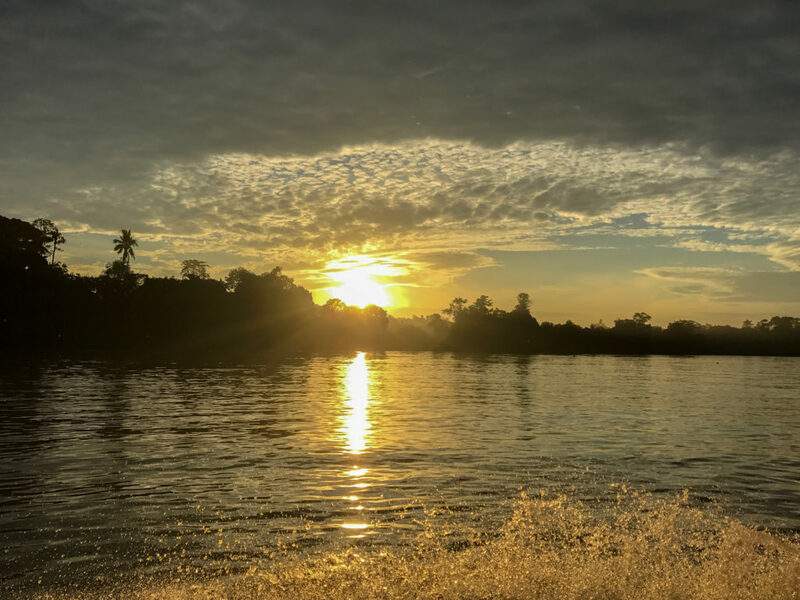 Our 2D1N river cruise adventure! 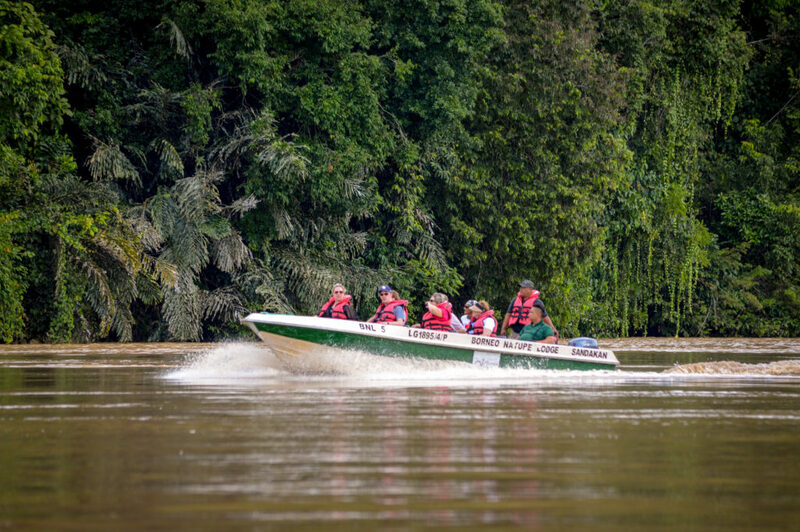 There are so many companies offering tours along the Kinabatangan; it was quite overwhelming deciding who to travel with. But we chose the reasonably priced Sukau Greenview B&B for a 2D1N package: you can see their itinerary here. 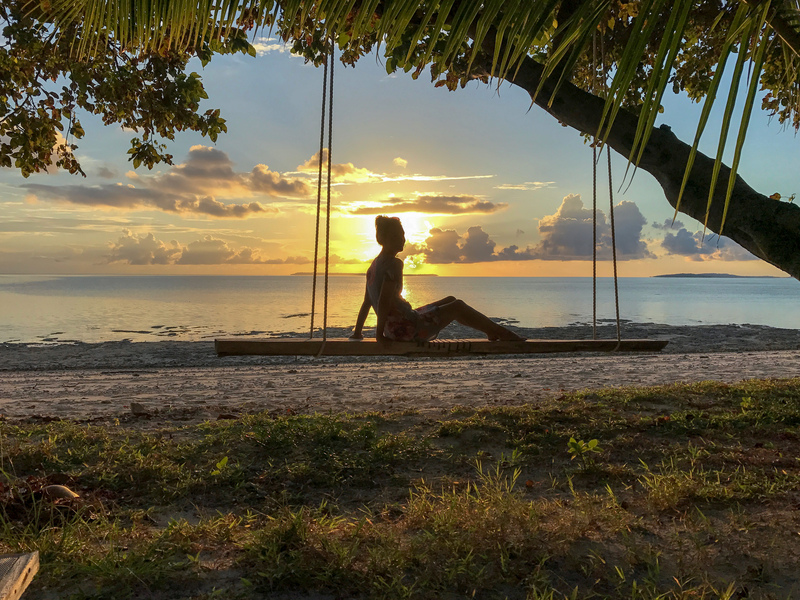 To be perfectly honest… most places offer exactly the same trip but for varying amounts of money. 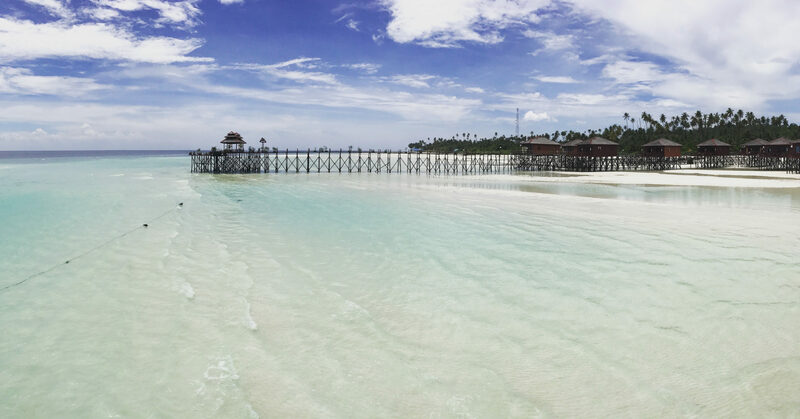 We were really pleased with the package and organisation at Sukau, so would definitely recommend them. The guides were great and have amazing eyesight(!) 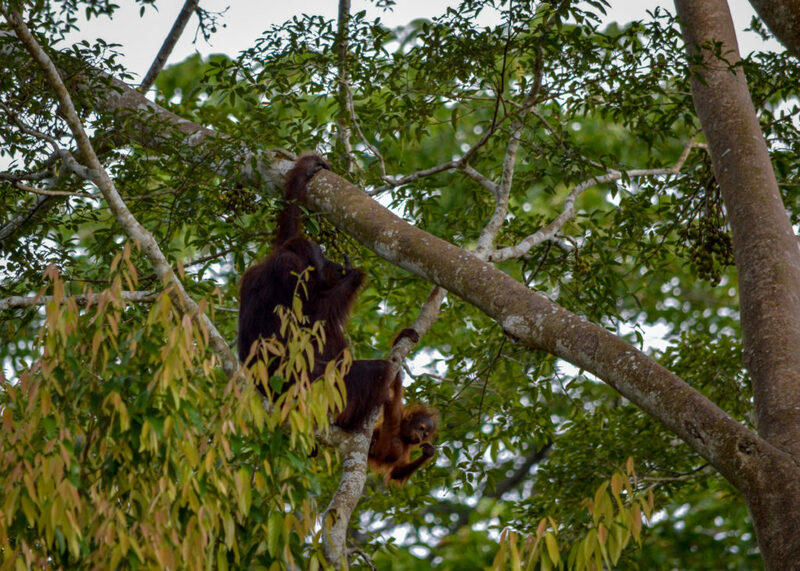 making sure we didn’t miss anything on our cruise down the Kinabatangan. 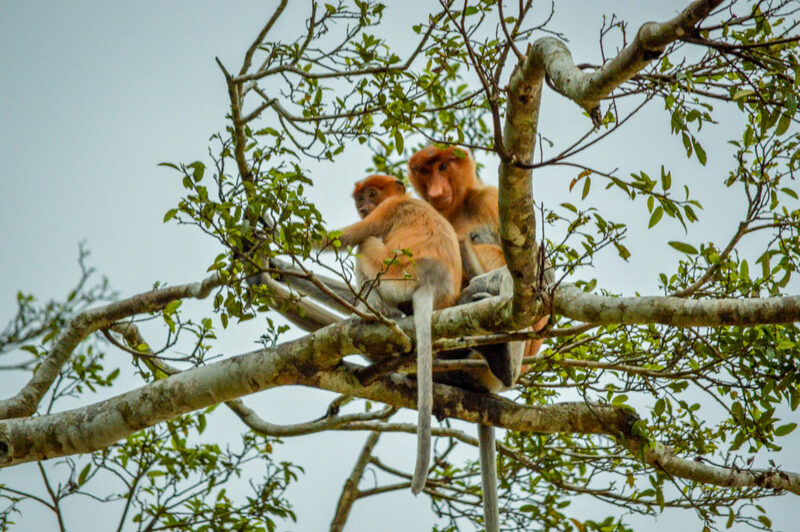 When planning our travels around Borneo, we weren’t sure how many days to allocate to the river cruise, but I think that the 2D1N trip was perfect – a jam-packed adventure where we saw everything we could’ve hoped for. 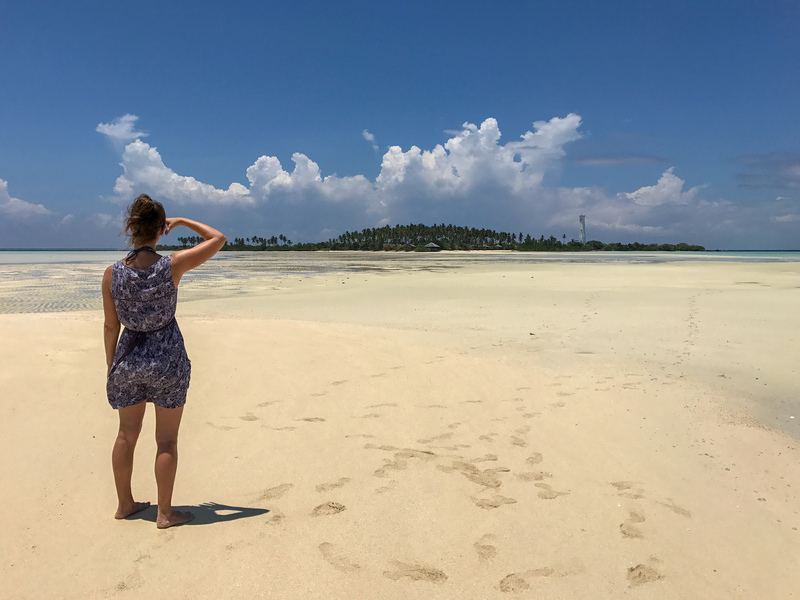 I personally don’t feel like people who stayed for longer got any more out of their experience, although they did do a hike into the rainforest … but that idea is far too scary for me! 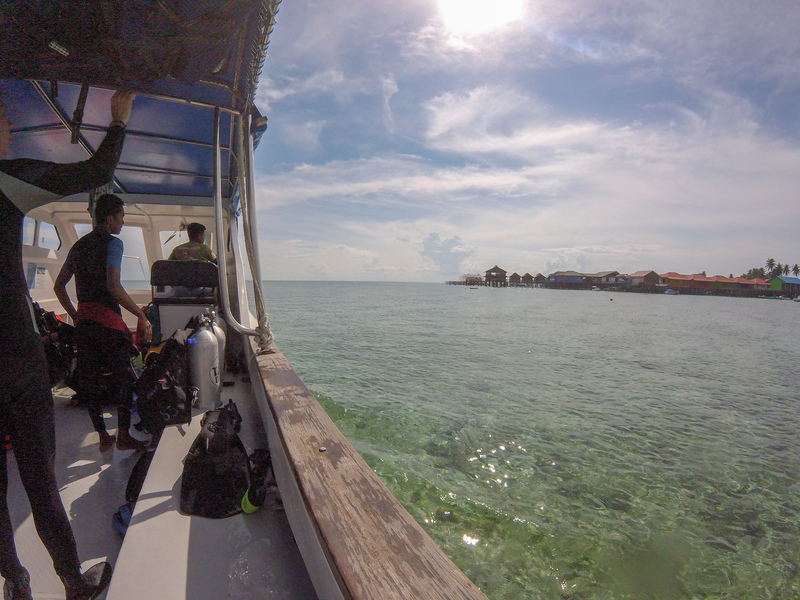 The accommodation was fairly basic but perfect for the short amount of time we actually spent there (we arrived back at about 10pm after a night-time cruise and were up again before sunrise)! The food served was a typical Malaysian curry and of course we were offered more rice at breakfast(! 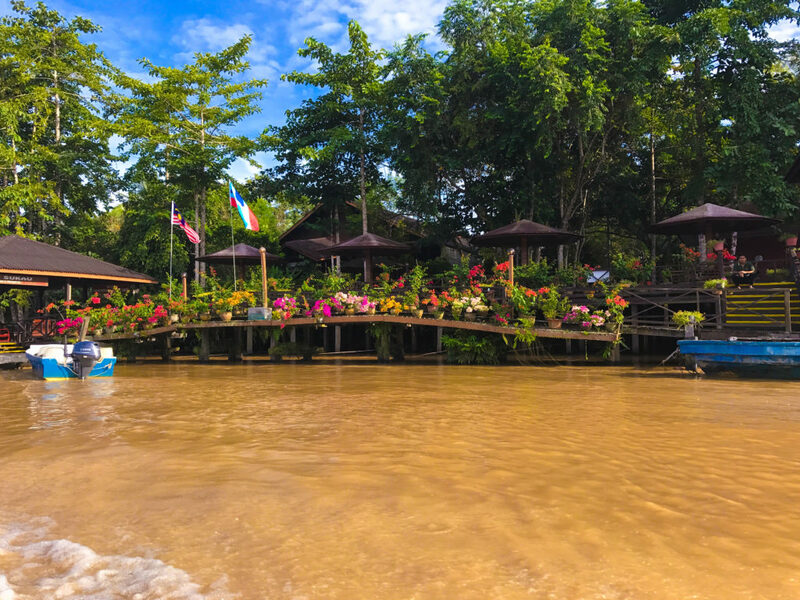 )… but the restaurant was on a balcony giving us lovely views down the river. Sukau Greenview sent out two boats for the afternoon cruise, they were so much smaller than I expected! 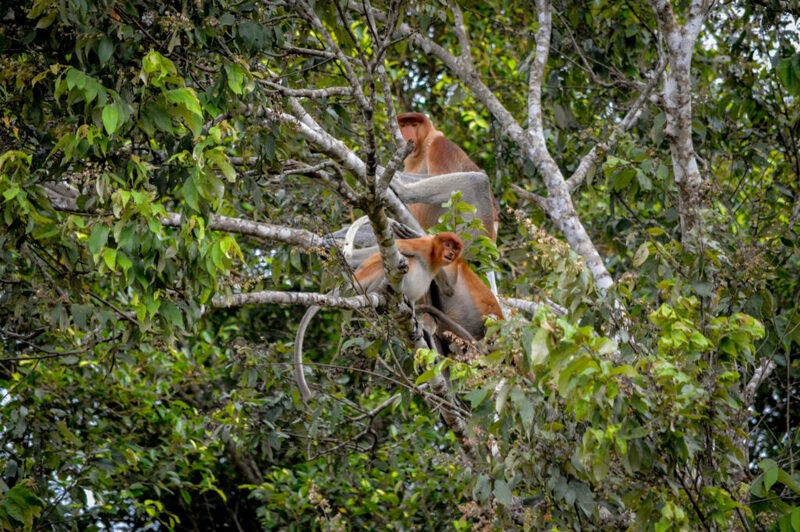 It was great though as it meant double the amount of eyes looking to spot wildlife (the guides were pretty amazing at finding stuff). 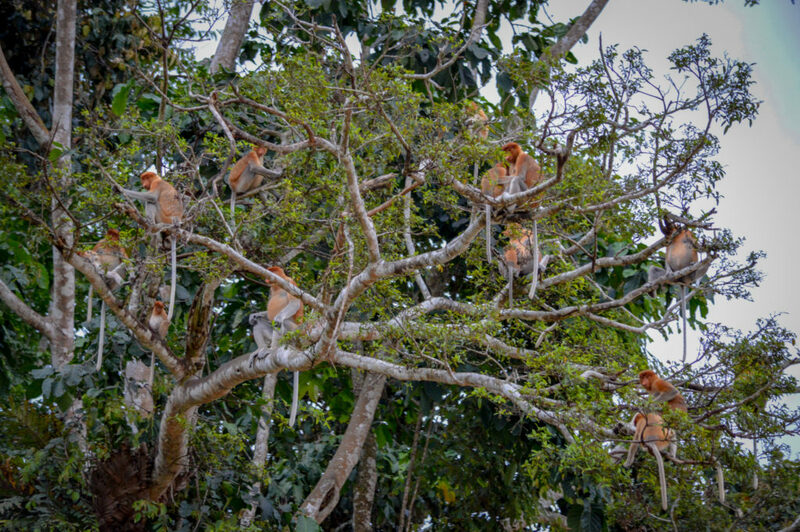 They’d even had a tip-off that the pygmy elephants were near by! 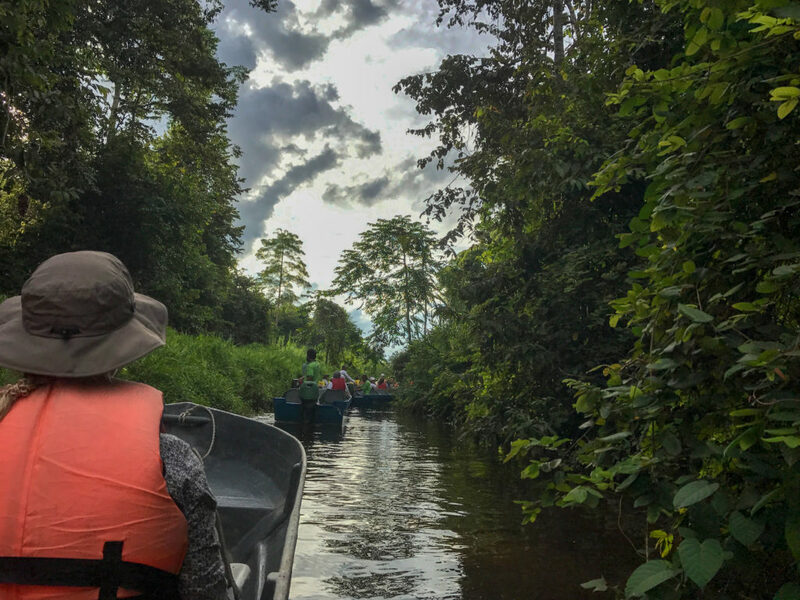 So our first afternoon cruise sent us in search of the tiny Bornean elephants but after ending up in a boat-traffic jam down a “one way street”, the palm oil plantation workers sent us packing. 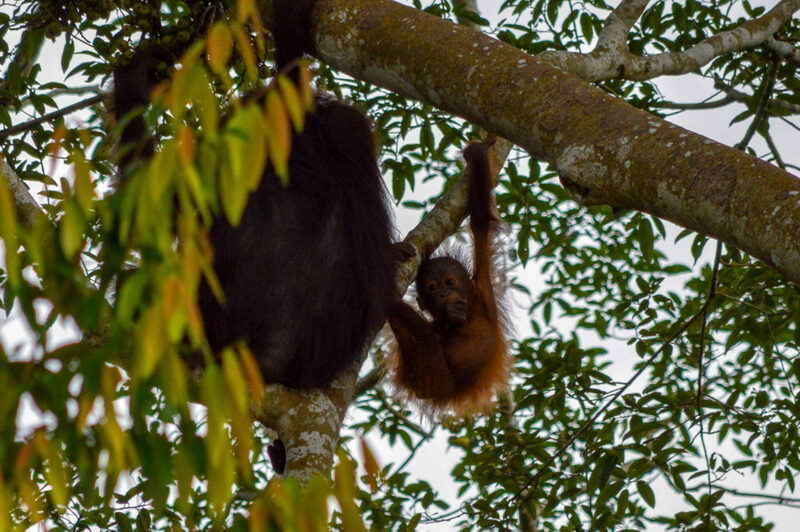 We did get lucky though and saw a wild orang-utan with her baby! 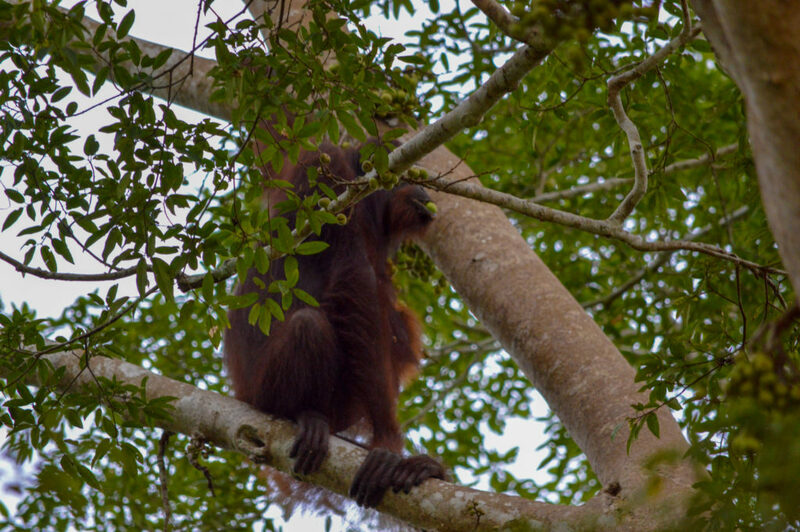 Wild orangutan spotted on the river cruise. 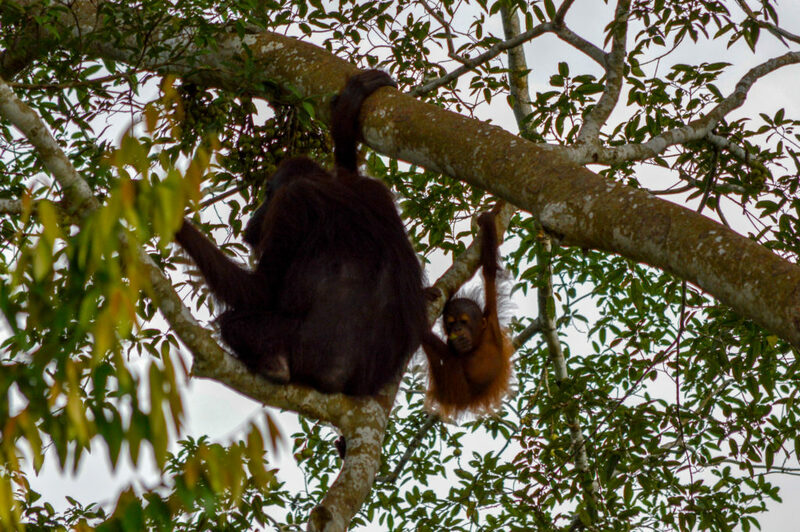 …And she has a baby! 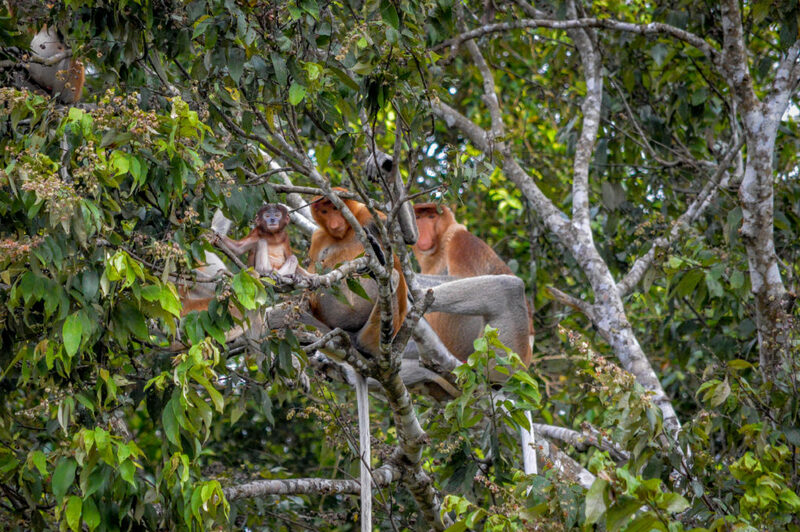 Before our trip, I wasn’t sure how much we’d actually get to see and I’m still not sure if we just got lucky but we saw loads of proboscis monkeys especially around sunset and sunrise. 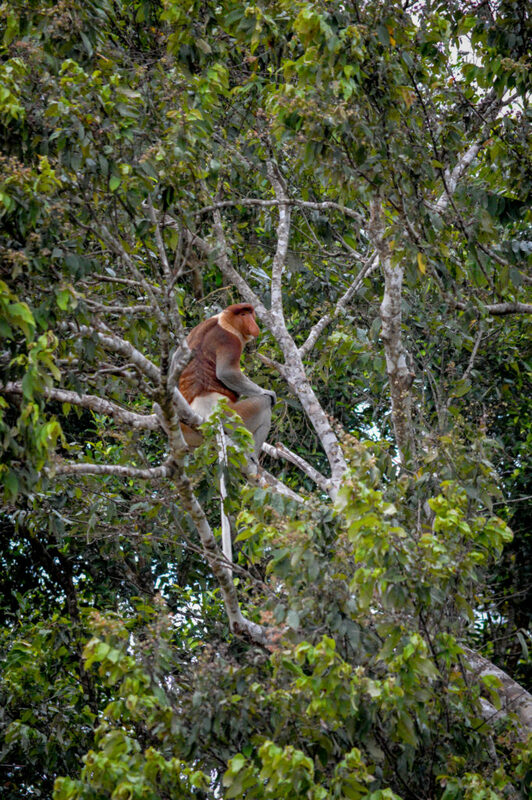 Our guide was really informative and told us that the proboscis monkeys come to the trees near the water edge because they can swim, so if predators arrive in the night-time, they’ll all just leap into the water! I definitely turned into a bird watcher overnight, I’m not even embarrassed to say it because the bird life was absolutely incredible. 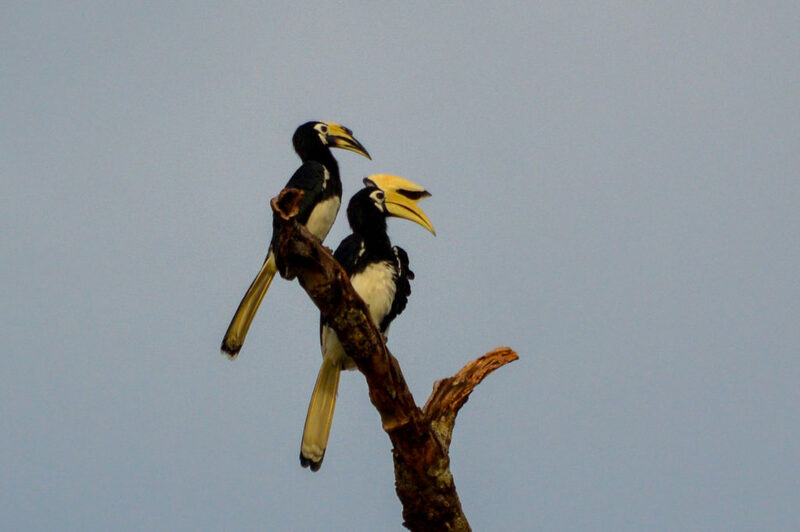 The hornbills had to be my favourite they were huge and looked so beautiful. 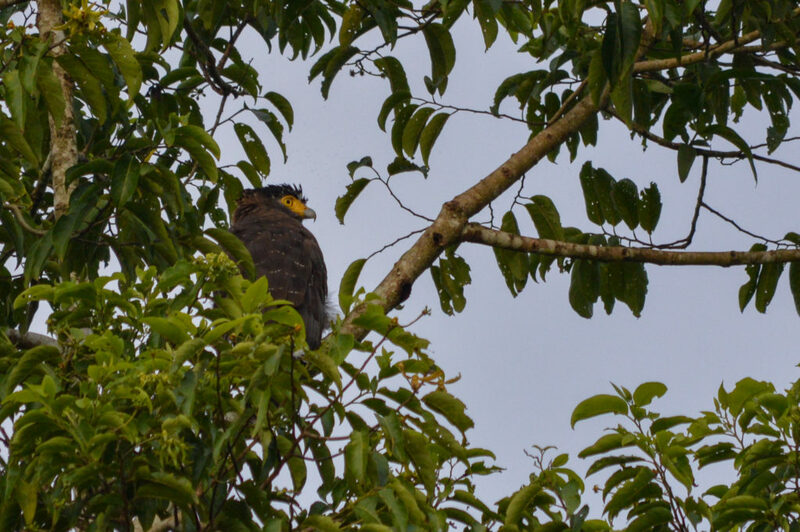 The birds were particularly active on our 3rd and final (sunrise) river cruise. 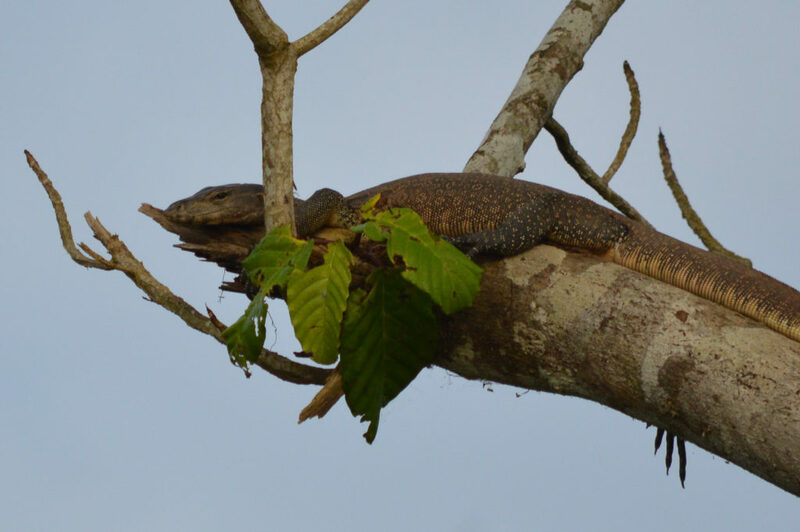 Spotting a monitor lizard sleeping up a tree! 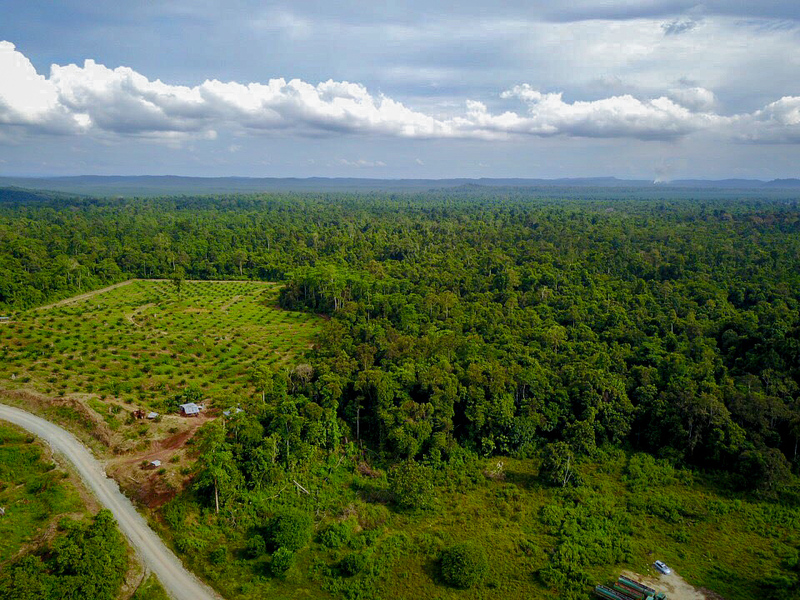 Sukau Greenview were so efficient with the schedule and made sure we arrived back in Sandakan in time for the morning flight if needed. 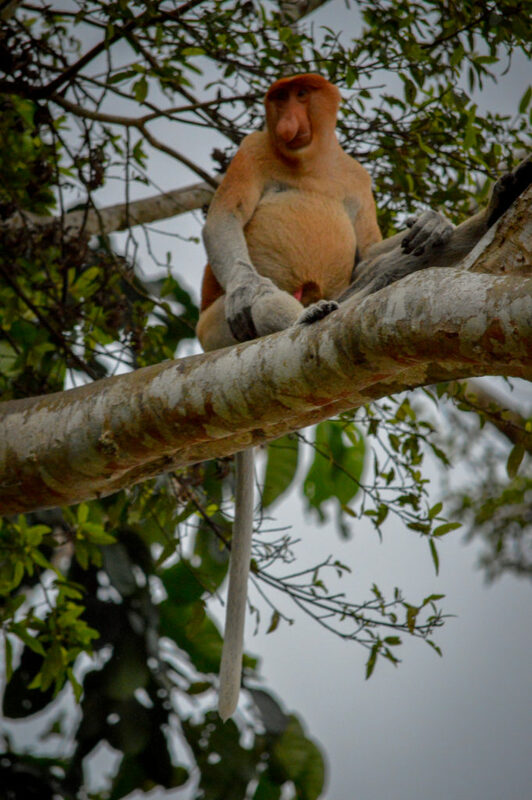 We weren’t heading off til the afternoon so spent the day in Sandakan only to realise we were glad we’d made the decision to stay in Sepilok, much quieter and more chilled! 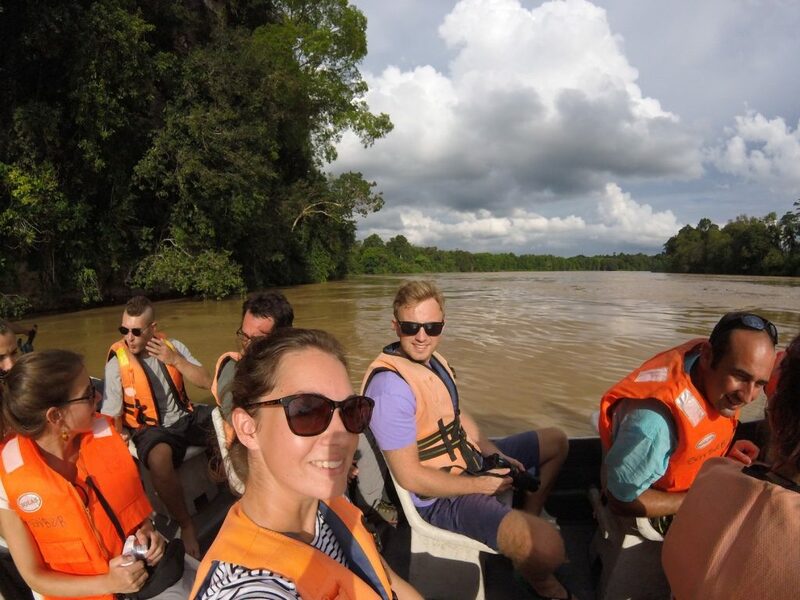 We had a great time on the Kinabatangan and would definitely recommend a river safari to anyone travelling in Borneo! Wow wow wow, just sharing this with Nana. 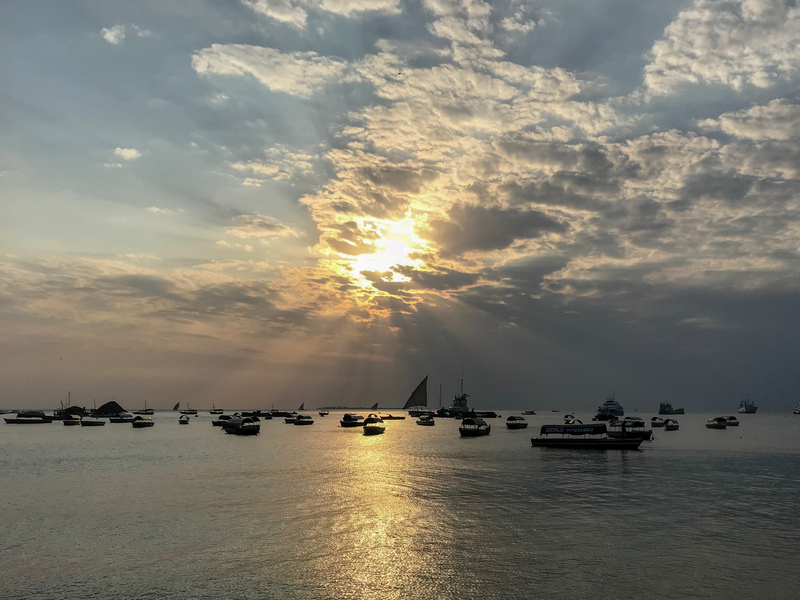 What a beautiful account of your travels, awesome videoing! You two are such an inspiration. So glad she was able to see it and enjoyed it! Don’t know about inspiration but we do have some good fun!